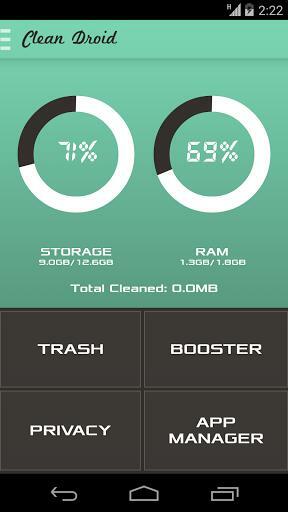 Clean Droid, A must have Android optimization and cleaner app. Clean Droid won first place in app-e-feat contest conducted by IEEE.All the optimization features you need to take good care of your Android phone is now in just one app. Save precious space and help boost performance & speed! ☆ Trash Cleaner: Standard and Advanced trash cleaners. ☆ Clean full system cache. ☆ Clean temporary data of Facebook, Whatsapp, WeChat, Instagram, PicsArt, PicSay, Mozilla Firefox and 100+ other apps. ☆ Clean advanced cache files and temporary data. ☆ Clean app leftovers when an app is uninstalled. ☆ Automatically clean your device when cache size > 100MB, > 250MB, > 500MB, or periodically. ☆ Privacy Cleaner: Clean your privacy apps. ☆ Clean standard browser history, browser search. ☆ Clean Google Play history. ☆ Clean saved records of downloaded apps. ☆ Clean passwords, history, cache and other user data via easy settings of top Android apps. ☆ Booster: RAM and Game boosters. ☆ Boost your RAM using our super RAM booster. ☆ Play games with higher speed using our Game booster. average boost of 15% for most games. ☆ Automatically boost RAM at screen off, or when RAM used is > 70%, >80%, >90%, >95%, or periodically. ☆ App Manager: Manage installed apps and stored apks. ☆ Move apps to SD. SD card not recognized? Go to Settings-scroll down and Tap ‘Quick Fix’- Then tap ‘Fix’ in popup. ☆ Move apps to Phone. ☆ Automatically backup newly installed apps. ☆ Automatically move newly installed apps to SD. ☆ Notify of idle/less-used apps in your device. ☆ Network Rescan Tool: Refresh your network connection easily without rebooting the phone. ☆ WiFi Rescan Tool: Lost WiFi connection? try our fast WiFi rescanner. ☆ Home Screen Widget: Clean trash, Boost RAM, or Launch games with extra boost from home screen. SD card not recognized? Go to Settings-scroll down and Tap ‘Quick Fix’- Then tap ‘Fix’ in popup.